The city is shrouded in smog and walking around, even for just 10 minutes, leaves your eyes stinging and your throat raw. Those of us still wandering around town are doing so with masks on. 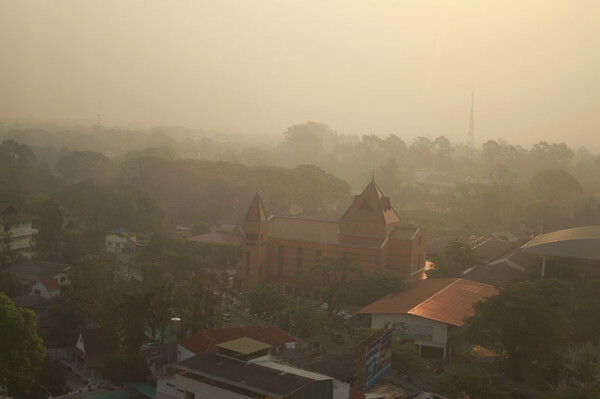 The March smog is actually nothing new – for years, people have talked about asthma issues in Chiang Mai during the pre-rain season. Last year it rained quite early, so the smog was minimal. So this is the first time I’ve experienced the smoggy, hazy late winter months in Northern Thailand. Why so smoggy? Farmers in Northern Thailand burning the fields to allow for replanting and regrowth. In 2009, the Irawaddy noted that “The traditional rural method of slash-and-burn farming, whereby fields are burned by farmers in the dry season between February and April, so that the ashes fertilize the fields while they lie fallow, is responsible for the greater part of the pollution.” And they’re so bad in the far North that there is talk of evacuation near Mae Sai.